...within the next few hours, if reports coming out that Governor John Kitzhaber will (finally) resign today. ETA: Kitzhaber will resign next Wednesday. 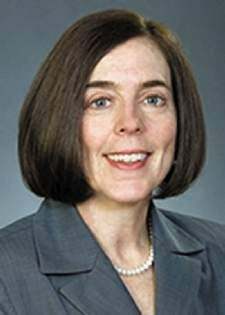 Oregon is one of the few states that doesn't have a lieutenant governor, so if the governor leaves office, the next in the line of succession is the Secretary of State, who is currently Kate Brown. This might actually be coming a few days late, as in it came out Kitzhaber actually called Brown back early from a conference in D.C. to Oregon for a one-on-one meeting, but then asked her why she left D.C. early once she returned to Oregon. But that should cue up biographical pieces on Brown, which will include the unusual role secretary of state plays in Oregon compared to other states ( it has a lot more work associated with it) along with noting Brown is openly bisexual, which will be a first for an American governor. And to think a few days ago, the craziest thing happening in the state was an attacking owl that now has custom warning signs up created by Rachel Maddow.